It must be very human and deeply embedded to forget all bad and unpleasant things in the last days of December. A festive mood has also seeped into the Verkhovna Rada. A Christmas tree was put up in the lobby, and Kateryna Lukianova (NU-NS faction) was handing out tree decorations to her fellow parliamentarians. A rabbit even appeared at the Rada. 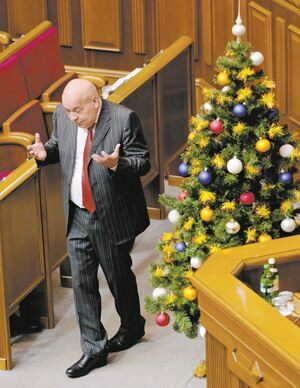 Roman Vintoniv, a journalist from the Breakfast with 1+1 TV program, showed up in parliament, wearing the New Year plush outfit of a rabbit. There was a mixed reaction to the “rabbit.” Some smiled, some filmed him on their cell phones, and others said he was nuts. Iryna Karmeliuk, a vigilant member of the VR press service, tried to remove the “rabbit,” arguing that parliament is no laughing matter. But journalists stood up for the colleague. “So you can hit people with a chair on the head but can’t come in the outfit of a rabbit?” The Day’s correspondent intervened. The spokeswoman was unable to reply and walked away. But the rabbit’s adventures pale against the backdrop of pension reform peripetia. Truly strange things are happening to this draft law. The government reportedly moved the bill in parliament on December 13. The text was registered and a serial number was assigned, but, in contravention of all the rules of procedure, none of the MPs, journalists, and others whom this might concern, could read the bill. For some unknown reason, it was not posted on the website. On Monday the speaker announced that the Cabinet had revoked the document in order to modify it. On Tuesday morning it was reported that the bill had been submitted again. The MP thinks there are two explanations of this inconsistency. Firstly, there is not a single approved text. Secondly, they do not want to shock people shortly before New Year’s Day. Yet there is a clause which the public is sure to welcome almost unanimously. One of the key provisions of the cabinet-drawn pension reform is a drastic reduction of pensions for MPs, civil servants, judges, etc. But there is also a snag here. Nobody is going to set the upper limits for the current “elite” pensioners. In this case, the powers that be have invoked Article 22 of the Constitution on social guarantees. But this is utterly forgotten when there is a need to raise the minimum pension. Incidentally, seven million Ukrainians receive a minimum pension of 750 hryvnias, barely enough to survive on.